What Hitchcock "touches" do you see in this early scene from the movie? The tilled camera shot of Grants enterance and the shot of Bergman listen to the record. The slow moving camera. How does Hitchcock choose to light, frame, and photograph his two stars in this scene?What are some of the contrasts that Hitchcock trying to set up between these two characters through art direction, costume, and cinematography? On Grant, straight forward and simple lighting making him look polished but not trustworthy. For Bergman, the lighting makes her look vulnerable and still beautiful. Based on this scene (or the entire film if you have seen it already), reflect on the casting of Cary Grant and Ingrid Bergman. Does this scene conform to or challenge their well-known star personas? As for Grant, he is rarely seen in a tshirt and jeans combination so this is typical Grant. However, the angles of shots Hitchcock puts him in, sets a menacing look to him. Bergman, has appeared in so many different period pieces that her persona was never defined. But she usually plays "not bad" women. The scene here shows her drunk with a hangover and in trouble with the law. Yep, so not her. I agree with Gehring in that this is a hard one to watch because of the angst and turmoil we feel for the relationships. I think that Hitch is at his best, creating real tension for us as a viewer because we have the information each of the principles are missing. I also appreciated the lecture info about the repeat POV shot...I think good artists, do not simply try a technique and then abandoned it....he is practicing, perfecting, revising. All marks of an artist dedicated to craft. This film does push buttons with regards to the stars and their personas...but only so far. We are led believe Alicia is a party girl...but really down deep she's loyal...Dev is hard and even cruel, but down deep he's devoted. I love the pairing and for me this film is timeless. By the way....Claude Rains has one of THE best movie voices ever....right next to Paul Henreid. As I would only know from listening to Professor Edwards, the spinning scene of Grant is similar to an earlier scene from an earlier English movie Hitchcock directed. Other touches could as just as easily in my mind be what typical American audiences want as quote unquote Hitchcock touches - well-dressed older man - beautiful young woman in bed. Man speaking briskly, unsympathetically to her and trying to get her to participate in something she apparently doesn’t wish to be involved in. Initially, they both appear in a bit of soft focus. The Grant character is suave, sophisticated, well-dressed. The Bergman character is disheveled, hung-over, and still wearing yesterday’s garments. He is standing; she is lying down. He is in control - plays the audio results from the bugging of her home; she is initially refusing to get involved. Again, I’m in the dark having never watched much of either star - I have a general understanding that they are popular, attractive, polished, well-liked stars. I understand that at the time, the public did not want to see their stars cast as villains and it seems that this clip establishes both as good, patriotic guys. I guess my own sensibilities are coming out a bit when I think the Ingrid Bergman character is too young for the Cary Grant character. I prefer the more equally yoked Mr. and Mrs. Smith. Early on I see the the immediate close-up of Ingrid Berman; secondly, the angled camera scene on Cary Grant. Hitchcock liked his close-ups on his leading ladies and the angled camera scenes were used in several of his movies. The frame is angled on Cary Grant to make us feel the headachy hangover view that Ingrid is feeling and then there’s alot of play with light causing shadows; shadows on the characters (as Cary walks in he is dark and as he comes into the room he appears lighter in shade) and on the blinds from the wall. Hitchcock is trying to tell us the time of day and the seriousness of Cary’s proposal to Ingrid because he shows the lights coming through the windows with Ingrid still in bed with her clothes on and Cary is clean shaven, hair combed and neatly dressed and very calm and purposeful in his stance making us feel that he is definitely in her room for a reason. I think Cary and Ingrid were very well cast for this movie, but along with Suspicion, this is one of the most serious devilish characters I have seen Cary play. In between Suspicion and Notorious, Cary played a high intense comedic role in Arsenic and Old Lace which I liked very much and he had quite a bit of other light comedic roles under his belt by the time he made Notorious. I think this role for Cary was a nice challenge for him to play someone who is mean and cold. However, this role for Ingrid Bergman was not that much of a stretch for her as it seems very similar to her 1942 role in Casablanca…and her roles in Gaslight, For Whom the Bell Tolls and Spellbound, were all very dramatic parts for her. After repeatedly watching (I love DVR's) Ingrid Bergman's upside down rotating POV shot of Cary Grant entering the bedroom I'm 99% sure this was achieved in an optical printer and not done in camera. The giveaways are the increased film grain and loss of contrast and sharpness as well as the too-smooth movement of the effect which would have been very difficult to do with the camera rigs of that time period. I imagine the shot was framed slightly wide so that it could be zoomed in and rotated in the optical printer to prevent the corners of the image showing as it rotated. The shot is still very clever and effective no matter how it was done. 1&2 In this scene Hitchcock uses unique POV camera angles to introduce our two main characters. Initially we see Bergman through Cary Grant's perspective laying on the bed with a questionable glass of liquid. Next we see Grant through her view only its from what a hung over person in bed would see. grant is shown in an angled camera shot in a shadowy menacing manner.it would seem easy to jump to conclusions about these characters, but as Hitch would want it, things are never what they appear to be. These two characters seem to be total opposites but come together as partners in crime and love. 3) In Notorious, neither actor is type cast.As Devlin, Grant is suave, sophisticated like his Hollywood persona though there is a touch of coldness and an unforgiving tough guy image we have never scene him play.He is riveting. Bergman is very surprising as the drunk party girl, cop cursing socialite. It is a total change from the wholesome images we've seen in previous movies. I found it so interesting that Hitchcock slowly softens both characters for the breathtaking conclusion of this film. 3. Grant is playing close to type, his usual suave and debonair fellow, but this one has a lot of menace. In this scene, he stands over Alicia trying to make her drink the bromide. He continues to menace her in a polite way to get her to work for them - he wants something from her. Before this scene, he even punched her in the car so he could drive! Only Cary Grant could get away with punching Ingrid Bergman. This is like him pushing Katharine Hepburn down at the beginning of The Philadelphia Story. We like him so much, he gets away with it without us hating him. Bergman is playing strongly against type as the slutty party girl. She usually plays so wholesome - even in Intermezzo when she is the other woman, she is forthright and healthy about it and is in no way the seductress. She is the muse for Paul Henreid in Casablanca and only had an affair with Rick because she thought her husband was dead. So even though she is deeply sensual, she always had ethics about it. You sense she doesn't even like herself at the beginning of Notorious. Claude Rains is great, but the really creepy villain in this movie is Madame Constantin. She just makes your skin crawl in her scenes; she is so diabolical. The cool angles & POV shots, such as the view of Cary Grant when he comes into the room and we see it from Ingrid Bergman's viewpoint, so that he is turned completely upside down as he talks to her. 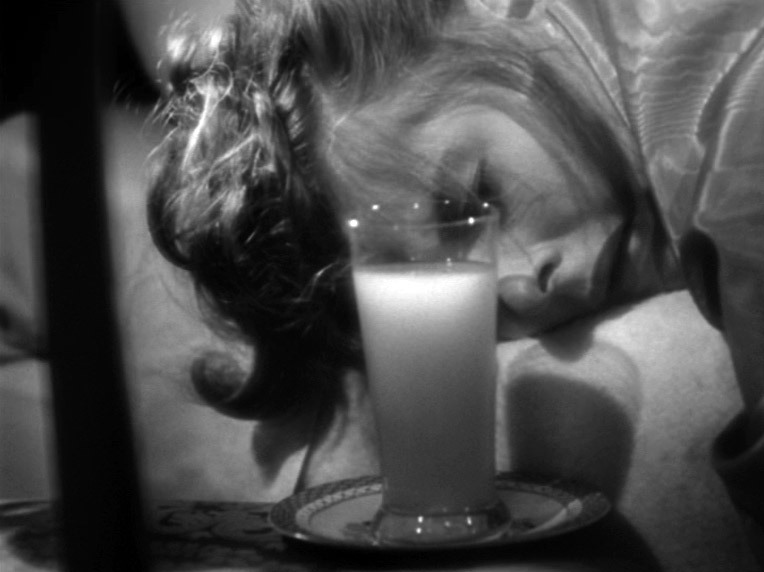 The POV closeups of Bergman's character as she wakes up & sees the glass before her & is told to drink up by Cary Grant. The use of shadows/light on Cary Grant, particularly, like when he is standing in shadow in the doorway. 2. How does Hitchcock choose to light, frame, and photograph his two stars in this scene? As mentioned above, having Grant in dark shadow, framed in the doorway at first. The extreme closeup of Bergman early in the scene, giving us insight on how she feels at that moment - hungover, tired, groggy. We get several closeups to moderate closeups on each of them here. By the end of the scene, as she is confronted with her true feelings on the topic of patriotism and serving her country , they are finally standing closer together, the two of them rather framed together in the doorway. What are some of the contrasts that Hitchcock is trying to set up between these two characters through art direction, costume, and cinematography? His suit seems very neat, precise - and dark. So, while he seems to be one of "the good guys," there is still some mystery there and/or a strictly-business attitude that prevents us from really, fully knowing him at this point - is he really as good as he is supposed to be? Also, again, the mystery involved considering his very dark clothing. Her outfit, on the other hand, seems more "fun," sparkly, a mix of light & dark - oh, and it seems to be the outfit she was wearing the night before. So, not at all as put together as Cary Grant in the scene. In this scene, I see a bit of both. There is conformity. For Cary Grant, he is working with the good guys against the bad Germans; he is suave, fashionable, trying to get a person who is "on the fence" to do the right thing & help her country. For Ingrid Bergman, despite the way her character seems, we learn she does love her country (U.S.) enough to refuse to help her father when he had tried to get her to work with some Germans against the U.S. Still, Bergman's character might also be something of a challenge, as she seems to initially be playing against the type we expect of her by apparently being a devil-may-care party girl whose father is a traitor. And, back to Grant, he also seems colder & more business-like than we often see from him. The Hitchcock "touches" I notice are the creative camera angles ... the famous upside-down POV shot of Cary Grant walking towards her as she lays on the bed ... subtle humor as when she finds her hair piece/bun. She is slightly comical in her hangover state which makes her more likable and sympathetic. I've always remembered the gown she wears in this scene ... the stripes might imply she is a prisoner; trapped in her party-girl life, daughter of a traitor, etc. Cary Grant is low-lit in the beginning of the scene. His face is slightly obscured. He is framed nicely in the doorway but on an angle. She isn't sure of him yet and neither are we. Ingrid Bergman is lit very brightly early on ... almost as if she is being interrogated under a bright light. I liked how when Devlin is playing the recording that proves her patriotism, she steps from shadow into light. Cary Grant is calm and commanding in the scene. He's dressed neatly and is in control of himself and his environment. Ingrid Bergman is a bit of a mess in this scene, albeit a beautiful one. A strange man is in her bedroom, she is hungover and disheveled, still wearing her crumpled gown with a bandana tied around her waist from the night before. Her hair is a mess. She is shot from close up. Grant is part of a wider shot usually. I love this movie and I've always liked their chemistry together. I think this film conforms to their star personas for the most part. Perhaps some feel Grant is less likable in this, perceived as hard and using Bergman as a means to an end. I've always looked at the character as protecting himself from someone he doesn't trust yet. He feels a fool for falling in love with her, particularly given his line of work and her lifestyle and background. Maybe the party-girl image was a departure for Ingrid Bergman but I think this character is likable and sympathetic as almost all of her characters are. She is sweet and funny and we know from the recording she has integrity and good intentions. I see that Alicia is a heroine left to fight with her own resources. The same goes for Devlin, even him being a spy! As a narrative, this scene doesn’t have much of the Hitchcock touch. Also, Devlin sounds like devil. A word play, perhaps? The first thing I noticed were the shadows above Bergman’s bed – I’ll have to look up how the scene compares to the one involving milk in Suspicion. She is a clear figure, in her white nightgown and sheets, her almost blonde hair. He is a darker figure, with black hair and black suit, and he is first seen as in the shadows. He is more serious person than she is. But she can be serious – she’s not wearing an all-white outfit, but a striped blouse. She can be a mix of serious and non-serious. In this film, Cary Grant is once again a reluctant character, something he played in other of his most famous films, like “Arsenic and Old Lace”. Here, he is reluctant to accept that he has feelings for Alicia (Bergman) – he is focused on the mission, and doubts a little of Alicia’s seriousness. Bergman is great – as the lesson told, she is a mix of pure and bold. I think she’s perfect for the role, and can be more mundane than Grant. Hitch sets the mood and tone of the movie once again early on giving us information so the viewer is able to focus on the characters and relationships drawn together of seemimgly ordinary patriotic citizens as so unveiling the villain is the end result. Grant domimates and gives orders immediately to Bergman who then will have to use her own resources and we sympathize and know she is a pon in a much bigger objective. The POV demonstrates this with her having a hangover but also conveys the character as distortion: looking through the glass as confusion, life being turned upside down with circuimstance and demands with Grants rotating scene and the costume of confinement/chain-gang against her will. Yet, she is to be the hero and evil has been lurking around her even though she fights to have a normal unthreatening life. The harm is also going to take place in public as she is asked to go to Brazil and infiltrate. The close ups are on Bergman allowing the viewers to be intimate with her character and her personal attachment to country and pain from betrayal of family. Grant is portrayed as a ordinary agent on a mission with no personal attachment, stiff with no regards to her mental state reeling her in on an emotional level, the recording. He is shown as the bigger picture. Both actors are a canvas for Hitch to tell a story and he has once again molded their talents into perfection getting them out of comfort zones, developing and reveling their ability to captivate an audience on Hitchcock time.....suspense genius. Close up shots and camera angles used in specific ways brings the Hitchcock touch about. light and soft against hard and edgy in terms of light, frame photograph, art direction, and costume were used in favor, to show the contrasts of a well put together man and a semi messy woman, both with similar outspoken and strong attitudes. 3. Based on this scene (or the entire film if you have seen it already), reflect on the casting of Cary Grant and Ingrid Bergman. Does this scene conform to or challenge their well-known star personas? Two different types of people that came into the picture in perfect synch. Cast was just right with no apparent challenges. 1. He starts with a great rotating POV shot (I can watch it over and over), Cary Grant is Cary Grant and Ingrid Bergman is Ingrid Bergman, they're two of my favorites, and they're perfect together. The light and dark contrasts are very Hitch / noir. He sets up the story early, letting you know they're spies, rough around the edges, but experienced and capable. There will be intrigue, and most certainly romance. 2. As briefly mentioned above, the lighting, shadows and contrast are just great, it's very noir and very rich, there's a depth to the scene, I mean how is it just black and white? They're dressed for their parts too, she's rough, but looks incredible, and he's sharply dressed, he's good at what he does, spying, getting (reluctant) people to do what he needs them to do, he's intelligent, and larger than life (really they both are). When we think spies and secret government missions, we think of them, they are the mold for where I mind goes when constructing these characters in our imaginations. 3. Most certainly, they are who they are, Cary and Ingrid, and they bring every bit of it to the screen, they're just so good at what they do, they truly become they're characters, and take us with them on this very believable and exciting journey. I thought this scene was pure Hitchcock from start to finish, to the point that I immediately commented about it on Twitter. The skewed angle when Alicia wakes up and sees Devlin, and how the camera rotates as he approaches her, lots of POV shots, focus on the character's faces, as well as the cynical view of love; the use of a strong female lead, everything is Hitchcock here. 2. How does Hitchcock choose to light, frame, and photograph his two stars in this scene? What are some of the contrasts that Hitchcock is trying to set up between these two characters through art direction, costume, and cinematography? At first, Devlin is in the shadows, while Alicia is in the light. Devlin is trying to pull Alicia to do a dark job. Devlin is the epitome of suaveness, cool, calm and collected, well dressed, hair combed, while Alicia is just waking up with a hangover, she is a mess, hair is all over. Devlin has the upper hand on her. One thing that caught my attention was the glass of milk. I don't know how intentional it was, but I thought it was a subtle nod to Grant's role in Suspicion. A subtle way to keep us on our toes and guessing about him. Other than that, he is just suave and he uses that to perfection in his role. Wes Gehring mentioned in the Lecture Video that Bergman had a "European vulnerability" or something to that extent and I agree. It also reminds me of something that was said in the first modules about the audience being more worried about the characters if they are played by stars, so I suppose that is true as well. From the start of the scene to the end of the scene, it was totally Hichcock. Devlin is a nice, well dressed man, whereas Alicia is in bed all messy and not feeling well. I think for both of the actors it was a challenge for both of them. ​The amazing shot of Cary Grant walking towards Ingrid Bergman. It is so great and very distinct and a great Hitchcock touch!. The other is the slow set up in the early scene of giving us a hint of what could happen. ​When watching this film I really did notice the use of close ups. I felt it really helped draw me in to the love that both characters had, it showed passion. The entire look and feel felt grant when it needed to, sinister and chilling when it needed to. The costumes were also simple but beautiful. I have to say after re-watching I really think this is a great film. It wasn't on my radar before as a top Hitchcock film but this re-watching made me appreciate it so much more. The cast was just perfect!!! I have to say Cary Grant fits in so well in this and any film for that matter, Ingrid Bergman is believable in all that her character goes through in this film. Claude Rains is great going from someone so in love, showing his feelings of betrayal, and defeat in the end. These are strong actors with well know personas but I just saw there characters in this film! They don't make them like this anymore! Daily Dose #12: Why Do You Care How I Feel? Hitchcock touches were seen in this early scene by very few sounds- first footsteps as Delvin walks through the other room until he reaches the door where Alicia is lying in the bed and the train whistle blows in the background. The upside down angle of the camera as seen in the film Downhill - I thought that was a clever camera move. Both high angle and low angle shots of Cary Grant and Ingrid Bergman were similar to his earlier works. As Delvin walks back into the other room, the camera is following him through the two rooms. I saw that camera pan in The Ring. At first it appears dark in the room where Alicia was lying in the bed. It might had been to set the mood or atmosphere but as Delvin starts to walk into room his presence seem to lighten up the place. There seem to be a few frames used for both stars as they moved about the two rooms. He places Delvin in a suit and Alicia in a beautiful yet plain looking sparkling strip blouse with a dark skirt. They do not appear to be a couple by their dress. By the close up shots of both characters, Hitchcock seemed to have forced me into the scene. Both stars played their parts in the beginning of this film. By their conversation it was well known that some kind of espionage was going on or about to happen. Cary Grant has always been my favorite classic actor because of his distinguished manner as he displayed in the first part of this film. Ingrid Bergman is one of my favorite female actress. She is always refined and classy even as she appeared hung over from the night before. Even as she combed her hair (listening to the high tech recorder -for that time period) she displayed an elegance like no other. And a plain Jane beauty at that. Hitchcock knew exactly how the audience (me) was going to respond to these two great distinguished stars. 1. What Hitchcock "touches" do you see in this early scene from the movie? The POV shot and tracking of Grant first in shadow and then walking toward Bergman. Since she is watching him, the angle changes since she is looking upside down at him. Before playing the record, Grant is as far away from Bergman as he can get; but as the record is played, he moves toward her and stands next to her, showing that he has gone from distancing himself from her to supporting her because of what she says regarding patriotism to her father. 2. How does Hitchcock choose to light, frame, and photograph his two stars in this scene? What are some of the contrasts that Hitchcock trying to set up between these two characters through art direction, costume, and cinematography? I mentioned the shot of Grant going from distance to support in question #1. In addition, the close up of her face as she watches him walking toward her and the upside-down shot. As to lighting, Grant is shown in darkness and silhouette, implying that we don’t know yet whether he is a man who can be trusted. Regarding costume, Grant is impeccably dressed giving the impression that he is above her whether in status or class. Whereas Bergman has on a flashy, provocative dress which implies that she is a “party girl” and looks at life from the bottom of a bottle. Her appearance is also marred by the way she keeps her hair and her demeanor during the previous scene and this one. 3. Based on this scene (or the entire film if you have seen it already), reflect on the casting of Cary Grant and Ingrid Bergman. Does this scene conform to or challenge their well-known star personas? Grant was known for his debonair and suave sophistication in the movies, which he continues in this film. I agree with the lecture video that she has a underlying melancholy, or I would say fragility or vulnerability, that lets the audience know that underneath this brazen party girl is a more sensitive woman who is confused and alone. The camera angle is Hitchcock trying to show Alice's hangover. The fact he uses the record to do back story, the male lead is a cop and the female is in trouble is like many of Hitchcock's other films' opening scenes. ​The male is in a suit and there on business while the female is wearing a party outfit and suffers from a hangover. This sets up the male to be the no nonsense guy while the female is the misguided out of control woman. ​For him, I think it confirms him as a steady, in control male who woman at the time loved. As far as Ingrid went, this wasn't the actress who goes straight home to her husband. It might have been a shock to her fans if her other work was less 'bad girl' roles. I think his use of sound and lighting are similar to other films. Bit i did notice how he uses the camera as a tool to convey feelings, emotion etc..You can tell thee is a hangover going on because of the way the camera is moving. Also his use of close ups. Well here we see a sense coif fashion coming in. We see a very straight laced fashion for the men and a very comfortable and relaxed fashion for the ladies. he uses fashion as a n accessory to develop character. The framing also converts emotions and attitudes of the characters on screen and the lighting helps establish atmosphere. I thin it really helped Begman cement her star status while also helping take grant into a new direction as a leading man. He has a shade of grey to his characters in hitch films that are not food in some of his other parts. 2. How does Hitchcock choose to light, frame, and photograph his two stars in this scene?What are some of the contrasts that Hitchcock trying to set up between these two characters through art direction, costume, and cinematography? Cary Grant is constantly active in his movements, yet retains a stiff, sinister poise echoed in his dark, crisply tailored suit. He is shown either from behind, in full figure, or in shadow. In contrast, Bergman is more passive, reacting to Grant, but her striped top and scarf tied around her waist, her dishevelled hair, mimic her inner turmoil. The scene is almost dreamlike--as if the two are engaging in a complicated dance to a record not playing music. 3. Based on this scene (or the entire film if you have seen it already), reflect on the casting of Cary Grant and Ingrid Bergman. Does this scene conform to or challenge their well-known star personas? I believe it challenges their personas and subverts the expectations of the audience. Although Grant looks his usual suave, debonair and well dressed self, his character is more subdued and serious than usual; he is missing his smooth, wisecracking, easy-going nature. Similarly, Bergman is shown dishevelled, with a hangover, lacking the poise, grace, and glamour of her image. She is vulnerable, reminiscent of when she played a prostitute against Spencer Tracy's Dr. Jekyll and Mr. Hyde. What Hitchcock "touches" do you see in this early scene from the movie? As the camera focuses on Cary Grant in the doorway - you're suddenly in Ingrid Bergman's aching head and seeing what she sees. Then begins the ultimate tracking shot of Grant moving toward the bed which pitches him upside down to Ingrid's eyes - oooh, my head! Fabulous shot. Seeing Grant in shadow is also a Hitch touch, as he doesn't want us to know who it is right away, because Ingrid isn't fully awake yet. Also, the extreme closeup of Ingrid's face and her agony at being awakened after a night of drinking puts us in her POV as well. When we first see Cary Grant, it's the back of his head, all in shadow - just like a spy. Likewise, he's impeccably dressed and fully in control of himself, as a handler, (unlike Leo G. Carroll in North By Northwest!). Ingrid is far from a spy-type person because of her dishevelment, or so you think, until she and Cary connect. She is filmed in extreme closeup in all her hungover glory, and even in the driving scene, she is the one you can't keep your eyes off of. She is dressed simply and stylishly without a lot of frills as someone who is vulnerable, not hidden down below so many layers (accessories). What you see is what you get. In the later scenes in the home of Sebastian, Ingrid has become the woman in control, calmly calculating how to complete the mission and provide the U.S. (Dev) exactly what it asks for. Based on this scene (or the entire film if you have seen it already), reflect on the casting of Cary Grant and Ingrid Bergman. Does this scene conform to or challenge their well-known star personas? Definitely the scene conforms to their personas - Cary Grant - the consummate male-in-charge, with a tender spot in his heart for a beautiful and vulnerable woman, and Ingrid, beautiful but doesn't know it - seeking approval for everything she does. Willingly tries to please the man she loves, even it it means taking a huge risk. 1. The Hitchcock touched I see are POV shots, odd camera angles, survey the room and framing of Grant in the door frame. He is also using shadows on Grant giving him a sense of there being something not disclosed. 2. He frames Grant in the doorway. He is using the camera to show Bergman as being confused. 3. Grant and Bergman have instant chemistry. You can se it when he looks at her. He has already started to like her. They play extremely well together. You can see an instant attraction when they look at each other. The obvious tilted camera angle of Cary Grant to reflect Bergman's drunkenness. There is a distant train whistle and musical theme once the hook has been set. They never appear in the same frame until he plays the recording of her to set the hook for her involvement with his scheme. Constant cuts back and forth, then push-in for the medium range close-ups of each. The lighting differences between characters is dramatic. As he stands in the doorway, the light is behind him, casting his face in shadow--very intimidating. However, the lighting on Ingrid Bergman is brighter--an awakening. He is very well dressed (important), she is more casual (common). Not entirely. This scene challenges Cary Grant, who usually plays a suave/debonair character rather than the intimidating heavy. Ingrid Bergman is not playing the glamorous "nice lady."